The Nation, oddly, didn't take notice of the fire until a year later. 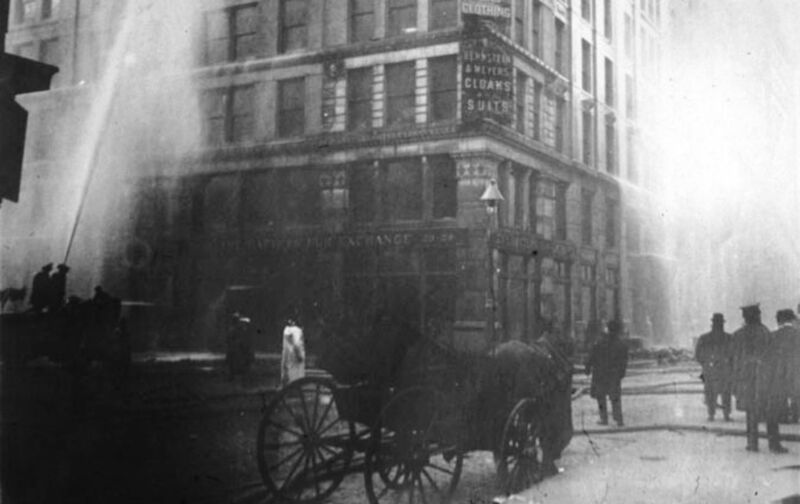 One hundred four years ago today the Triangle Shirtwaist Factory near Washington Square Park erupted in flames, killing 114 workers. Disturbingly, The Nation apparently took no notice of the tragedy until a year later. The conservative, anti-labor bent of the magazine at the time likely played a role in the editors’ decision to ignore this horrific and otherwise well-publicized incident—a landmark moment in the history of progressivism and labor law. The author of the following article (March 7, 2012), regarding a report on the fire that was released a year later, was William Mackey Wherry Jr., a utilities lawyer in New York City and a founding member of the NAACP legal committee. The dreadful loss of life in the Triangle Waist Company fire of a year ago brought home to the people of New York, as nothing else could have done, the lack of proper exercise of the police power of the State in safeguarding the lives of industrial workers. The most superficial examination revealed the fact that the loss of life could have been prevented, in fact that the fire itself would probably never have taken place, if the simplest precautions had been in force in this factory. If smoking had been prevented, the cigarette which started this fire would not have been lighted and thrown into the pile of waste. If the waste had been properly disposed of in fireproof receptacles, the fire could not have spread with such tremendous velocity. If an automatic sprinkler system had been installed, the fire would have been put out before it got any headway. If the workers had not been so crowded together and the aisles so clogged by their chairs and machines, the panic would not have started and the exits would not have been clogged. If the exits had been properly marked open, and brought to the attention of the workers by signs and fire-drills, the workers would have been able to escape from the fire in greater numbers and the loss of life would have been much reduced, even if the other precautions had been omitted. These facts were brought out at the time of the fire. It was also recognized at that time that the conditions in this factory were typical of the conditions throughout the city and State in numerous other factories.